Earlier this year we were approached by charity 1GOAL – which aims to ensure children around the world have access to education – to help shape their brand and to create a host of creative campaigns that would help promote 1GOAL across the globe. With such big ambition it was hard not to accept and with support from international organisations such as FIFA, Microsoft, Telefonica and Facebook we were certainly in good company. Like many organisations in their early stages, the 1GOAL brand identity needed a little polish. Before we could begin the task of visually communicating (to the world) it was important to ensure the brand graphics (in this case a handwritten chalk logo and little else) were designed and set up using a consistent set of rules, to truly help the brand and its message ‘come to life’. So we got to work. We introduced a typeface and a consistent set of rules for its use. 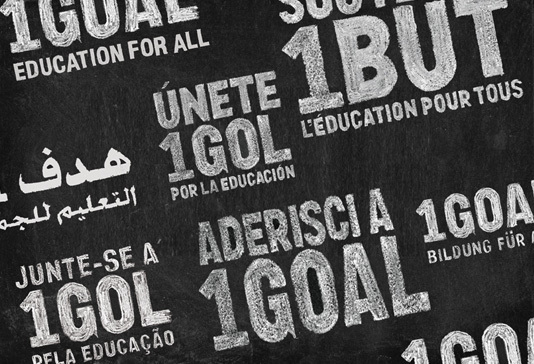 We created the 1GOAL logo in several different languages (French, Italian, Portuguese, Arabic and beond). We applied chalk marks around photographic imagery and introduced a consistent set of rules for headers, sub-headers and quotations. In short, we built up a ‘visual language’ that would mean campaign workers would have an identity they would know how to handle and be proud to use, and the outside world would begin to see (and recognise) a brand that had a real visual presence and personality. Since the very beginning, 1GOAL used football as a platform from which to communicate its message. But having the likes of Rio Ferdinand, Michael Owen and Ronaldo giving your organisation the thumbs up (or rather first finger up, which is the ‘on-brand’ pose for anyone in a campaign photo) is not enough to get your message heard. During the months prior to the FIFA 2010 world cup in South Africa – a main platform for 1GOAL’s global initiatives – we designed and created a series of promotional media campaigns to really grab the world’s attention. This included a ‘Campaign Manifesto’ which featured photographs of well known footballing icons and renowned global figures such as Shakira, Matt Damon, Jessica Alba and Queen Rania of Jordan (all of whom have played their part in supporting and promoting the cause). We designed promotional brochures and campaign reports, which were handed out to world leaders. Newspaper adverts were created and featured in leading publications such as the Daily Telegraph and the New York Times. We designed and built animations for tv and web campaigns and a series of animated graphics to be played on large screens at football stadiums (from Tottenham Hotspurs’ home-ground to World cup pitches across South Africa). Web banners took pride of place on sites such as ESPN and Facebook. Plus, we created a series of in-store posters that were exhibited in high street stores across Europe with the backing of companies such as Staples. And now, after several months of hard work and campaigning to get their message across, we’re pleased to say, the charity has nearly 20 million supporters world wide. Strategic and effective communication really does make a difference. With 1GOAL’s ambitious target to get over 70 million people supporting its cause worldwide, there is still plenty more to do. However, we’re pleased to say the charity has started to engage with Social Media platforms to further spread their message, and this, plus our continued efforts to help their communications be as creative and stimulating as possible puts them in a really strong position for the future. What do 1GOAL make of Mavo’s efforts? We’ve been lucky enough to develop an ongoing and close relationship with many of the team at 1Goal, and we’re of course enormously proud to have played our part in helping such a noble cause. Fortunately, 1Goal have been just as pleased to have worked with us. ‘Our brief to Mavo has been complex, with a need to cater to an incredibly broad audience – and we have been delighted with the results. Mavo’s creative take on the multitude of required executions – and the responsiveness and speed of their team – has exceeded our expectations. Their work has ensured that our name – emblazoned on thousands of T-shirts, watched on TV ads around the world, displayed on the big screens at the FIFA 2010 World Cup in South Africa and presented to world leaders at a global education summit – stands out from the crowd of other organisations clamouring for the world’s attention’. 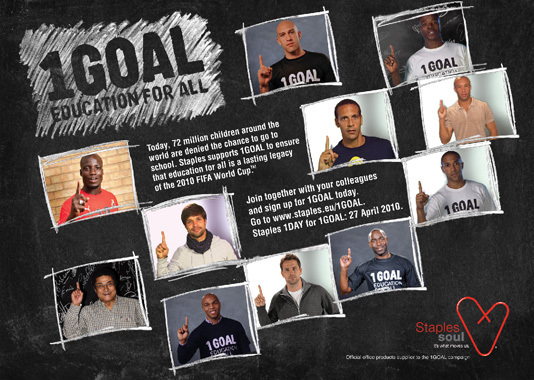 If you’d like to sign up to 1GOAL please visit www.join1goal.org.